Sinar Mas Group allegedly defrauded the Indonesian government of $15 million by avoiding reforestation taxes on 2,000 hectares in Jambi province. The land is reportedly managed by subsidiaries of Sinar Mas Group which do not have the proper concession permits. The discovery came after analysis of public reports and an audit conducted last year by BPK (The Audit Board of the Republic of Indonesia), as reported by the non-profit Indonesian Forum for the Environment (WALHI), an Indonesian affiliate of Friends of the Earth. "Sinar Mas evaded reforestation taxes through three subsidiaries to the detriment of as much as 181.7 billion rupiah [~$15 million]," said Musri Nauli, Executive Director of WALHI Jambi. 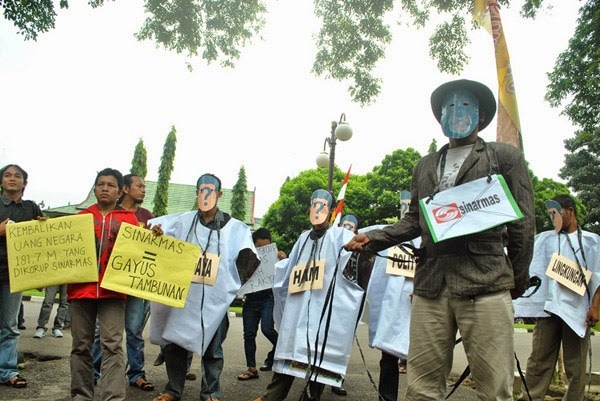 Musri spoke with Mongabay-Indonesia after a demonstration outside the High Court in Jambi on January 9th. He hopes the issue will provide new momentum, and encourage the Indonesian government to investigate other crimes committed by Sinar Mas Group, a conglomerate that owns a web of companies in Indonesia. "So far, the Jambi Attorney has been fairly good about looking into corruption cases involving local officials, so we hope this case will also be thoroughly investigated," Mursi said. On January 8, the High Court questioned the head of the Jambi Provincial Forestry Department, Irmansyah Rachman, about the status of the 2,000 hectares, and about allegations that tax evasion and other violations have cost the state millions of dollars. The Assistant Special Criminal Attorney of Jambi then commissioned a joint team comprising the Attorney's office and the Provincial Forestry Department to investigate the issue. When asked for comment, a representative at Sinar Mas Group's PR office in Jambi, Taufiqurahman, told Mongabay-Indonesia they are waiting to hear the results of the investigation. "There is a new process for verifying locations, and we submit to and respect all the legal processes undertaken by the Attorney," Taufiqurahman said. In addition to the tax evasion allegations, WALHI Jambi is also requesting the government conduct investigations into other crimes committed by Sinar Mas Group, and thoroughly review the Sinar Mas subsidiaries operating in the area. Sinar Mas Group began operation in Jambi Province in 1990, and now controls 59% of the 1.3 million hectares of province's forest plantations. The group's expansion targets would put them in control of 1.5 million hectares, or a fifth of the total land area of Jambi. "These conditions will increase the conflicts between the company, the public and the wildlife, as well as increase the risk of natural disasters such as floods and droughts," Mursi said. "With a population of over 3 million in an area of 5.1 million hectares, the people of Jambi are faced with limited access and limited management options due to the aggressive practices of timber plantation, oil palm, and mining companies in Jambi," Musri said. He then reiterated WALHI Jambi's commitment to oversee the legal proceedings. "We will continue to monitor the legal process undertaken by the government of Jambi concerning this case," Musri said, "However, if after 3 months this case has not progressed, we will take it to the national level."